Well, I was in Montreal, and I just had to have poutine. I haven’t had poutine in close to two years and I dreamed of it, I salivated over the idea of it and finally this week I squeezed in a quick visit to Pizza Pita and ordered my poutine. It did not live up to my high expectations. I would even go so far as to say it was “meh”. I expected to be transported to gustatory nirvana. Didn’t happen. Well, I guess I am finally cured of eating a “heart attack in a bowl”. not me!! i defrosted me some gravy last night and made myself a dinner’s worth of poutine! totally worth it. Le sigh. So what went wrong with my poutine experience? Any idea? couldn’t tell you. maybe a bad batch of gravy? H, your heart will thank you ;)!! Personally, I tried it once & thought exactly that-meh, not worth the calories!! I guess we can’t tease you about poutine anymore :)!!! I told you what was wrong with your poutine experience… that you’d been fantasizing about it for two years, and something like that can never live up to expectations. Sorry that your fantasy is now but a distant memory, but happy (as is your nutritionist husband, I’m sure) that you will move on to healthier fantasies like the obligatory square of dark chocolate per day. the tricky part is the gravy. i have tried lots of different Kosher gravies over the years; powdered, canned… and pizza pita has the best one. Make up for the disappointment with some good chocolate. I was going to say exactly what @wifeofmottel said. It is always disappointing after having something in mind for so long. Give it one more chance the next time that you are in Montreal. Speaking of unhealthy foods I eel the same way about Ernie’s chopped liver. But I hear that Papa Ernie’s is closed now. Not sure if Ernie and Ellie’s uses the same recipe. 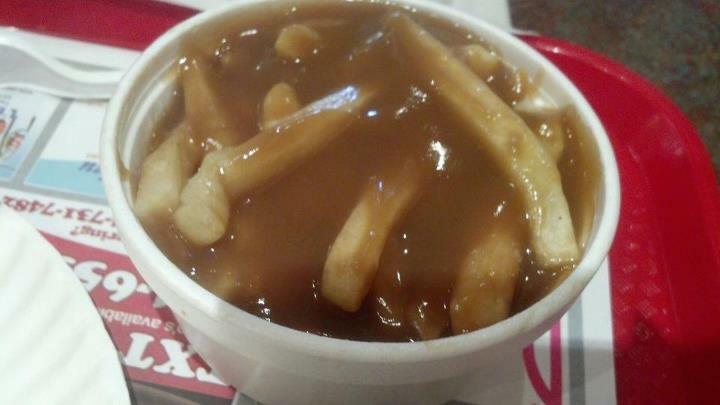 I’m from Montreal and I have to say that you picked the wrong poutine place…these aren’t the traditional home cut fries, I don’t even see the cheese, and it’s just drowning in sauce. What a shame that your craving was ruined…I know how you feel but next time try out the poutine from La Banquise near Mont Royal, you won’t be disappointed…or even some of the little hole-in-the-wall ma & pa type places usually have great ones too. Better luck next time one one of my all time faves! DishDelicious – I am sure your point is exceptionally valid – but those of us who keep kosher are limited in where we can purchase poutine. As far as I know there are only three kosher restos in Montreal who have poutine. I miss the “real” poutine. Fresh cut fries, squeaky cheese curds and real gravy…. but, the closest that comes to the flavour of the original is Pizza Pita. I feel it’s all in the gravy. How come you eat Poutine at a Pizza Pita place? From your description, I imagined the gravy had to be bassari???? the gravy is pareve. made from an onion based stock. a poutine is made up of french fries, cheese, and gravy. much easier to make it pareve than fleishig. Actually I think Poutine is Dairy. I think LLL is correct that it is dairy & the gravy is pareve obviously at a kosher eatery even though it typically would not be kosher (with meat gravy & cheese…) at a non-kosher Quebec eatery. curds are nearly impossible. I have never seen them, but that can be substituted with mozzarella cheese. it’s the gravy flavour that is the challenge.